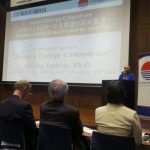 Sasakawa USA and Sasakawa Peace Foundation held a roll out of Japan’s Energy Conundrum and the book’s Japanese language executive summary on October 23 in Tokyo, Japan. 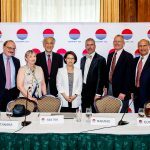 On June 25, Sasakawa USA held a book launch for Japan’s Energy Conundrum at noon at Washington DC’s Army and Navy Club. Edited by Sasakawa USA Fellow Phyllis Genther Yoshida, Japan’s Energy Conundrum tackles Japan’s attempts to manage and balance domestic supply and demand for energy, changing global energy markets, its climate change goals, and its overall energy security in the years after March 11, 2011. Sasakawa USA hosted a private, off-the-record discussion featuring Dr. Phyllis Yoshida, Fellow for Energy and Technology at Sasakawa USA. The event was an opportunity to engage in a candid conversation on the intersection between energy and climate, and mitigation and adaptation in Japan. 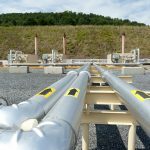 On January 8, Jiji Press reported that “a tanker carrying 70,000 tons of shale-based LNG arrived at a thermal power plant in Joetsu, Niigata Prefecture, run by Chubu Electric Power Co. The gas was loaded in Louisiana on Dec. 7 and transported to Japan via the Panama.” This shipment is a major event in U.S.-Japan relations; it is the first U.S. shale gas to reach Japan. 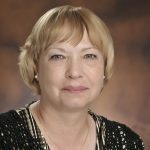 An interview with Sasakawa USA’s Dr. Phyllis Yoshida, Fellow for Energy and Technology, recently was featured in the December 2016 issue (Issue No. 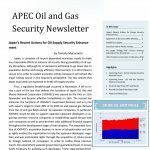 13) of the APEC Oil and Gas Security Newsletter. Click through to read the full interview.